When you are a famous player, top sports star, world champion, etc., then everyone would know about you, and also have an opinion. That's how it works. In chess there is of course today no one better known and written about than Garry Kasparov. Early this month, shocked by some of what was published on the FIDE website, I wrote about dirty election campaign tactics http://www.thefidetrainer.com/2014/02/fide-election-kasparov-vs-ilyumzhinov.html and while that has stopped, worst has emerged in poison pen emails to Federations and Delegates referring to completely one sided defamatory stories and opinions posted on an absolutely disgusting Blog without even admission of authorship. Well, even I was surprised at the depths that Kirsan Ilyumzhinov and his equally desperate cohorts were apparently prepared to descend to until I came across the following http://chessforallages.blogspot.pt/2014/02/secrets-of-kirsan.html. (In contrast of course, Garry continues to make waves in the international media with his promotional tour in Africa, everything positive, real and beneficial to chess). President of the International Chess Federation (FIDE) since 1995. Member of the party "United Russia". Created by New Vasiukov - luxury hotel complex on the outskirts of Elista. In 1993-2010, he led the Republic of Kalmykia, during which time repeatedly dismisses his government in 1998 announced its intention to withdraw from the Kalmykia of the Russian Federation, has repeatedly been accused of numerous financial irregularities and violations of federal law, but never prosecuted. Kirsan Ilyumzhinov was born April 5, 1962 in Elista, the capital of the Kalmyk ASSR [62 ], [ 35 ]. Ilyumzhinov father was a party worker, his mother - a veterinary surgeon [63 ]. At age 14, he became the champion Ilyumzhinov of Kalmykia Chess [ 63 ]. In 1979 he graduated with honors from high school [ 62 ]. In 1979-1980 he worked as a fitter at the "Star" ("DIR") [ 35 ], [ 63 ]. In 1980-1982 years serving in the Soviet Army, in parts of the North Caucasus Military District [ 62 ], [ 35 ]. Ilyumzhinov in 1982-1983 returned to the factory "Star". Worked as a mechanic [ 35 ], was the foreman of the youth brigade [ 62 ]. In 1983 he joined the Communist Party [64 ]. In 1983, thanks to Ilyumzhinov work experience (over two years), partisanship and great recommendations [ 64 ] entered the Moscow State Institute of International Relations (MGIMO). The institute was the deputy party secretary for ideology and captain institute team players [ 64 ]. In 1988, Ilyumzhinov had been expelled from the fifth year, according to a number of online media - for drug use [ 40 ], addicted to visit restaurants, alcoholism and even storage of potassium cyanide [ 64 ]). However, a few months later it was restored [ 63 ], [ 62 ]. In 1989 he graduated with the qualification "Specialist in Japan and foreign economic relations with the countries of the East" [ 62 ], [ 35 ]. In 1989 he became an intern Ilyumzhinov [ 63 ], and then won the competition and became the manager of the joint Soviet-Japanese enterprise "Liko-Raduga" [ 35 ], [ 41 ] (according to other sources - "Eco-Rainbow" [ 62 ], [ 63 ]). According to some media reports, in 1990, Ilyumzhinov made ​​his first million rubles [ 63 ]. In the same year Ilyumzhinov became president of the international corporation "San". Organized in Kalmykia bank "Steppe" (in 1992 the turnover was 15 billion rubles). According to media reports, in 1992, Ilyumzhinov as head of the association "Steppe" suggested that the Government of the Russian Federation Russian factories provide high-quality wool. It has been assigned a loan of about 11 billion (according to other sources - 14 billion [ 39 ]) non-denominated rubles. After receiving the money, the association "Steppe" listed their companies, which had to buy wool (also indicated that it had submitted their firms at interest), but none of them wool and not delivered, and most of the credit has disappeared without a trace [ 47 ]. Release of other publications, it was about fraud Ilyumzhinov 14 million rubles allocated by the Russian government corporation "Eco-Rainbow" for the purchase of wool. Also mentioned allegations that while working in the corporation "Eco-Rainbow" Ilyumzhinov received a bribe of $ 5 million for the illegal supply of crude oil to Japan [40 ], [ 64 ]. Several media outlets have published information about the disappearance of $ 5 million earmarked for the purchase of two lines of wool-washing plant "Elmi" [39 ]. March 18, 1990 Ilyumzhinov was elected deputy of the RSFSR from Manychsky Territorial District No. 821 (Kalmykia). Ilyumzhinov was included in the Committee on Foreign Affairs and Foreign Relations, was a deputy group "The sovereignty and equality" of the faction "Change - The new policy." Also a member of the Supreme Soviet of the last convocation - until the collapse of the Soviet Union [ 62 ], [ 35 ]. By April 1993, Ilyumzhinov has led more than 50 companies, banks and stock exchanges in the CIS countries outside the former Soviet Union [ 35 ] (according to other sources, Ilyumzhinov was their founder [ 63 ]). Several media outlets have pointed out that the annual turnover of these enterprises amounted to $ 500 million [63 ], [ 64 ]. In January 1993, Ilyumzhinov was elected President of the Russian Chamber of Business and president of the chamber of Kalmykia. In the same year he announced his candidacy for the election of the first President of the Republic of Kalmykia.Ilyumzhinov campaign held under the slogan "Rich President - incorruptible power" [62 ]. In April 1993, Ilyumzhinov won the election, receiving 65 percent of the vote [ 62 ], [35 ]. According to some media reports, after winning the election, Ilyumzhinov made ​​himself president of state-investment company "Kalmykia", which owns controlling stakes in major industrial and commercial enterprises of the country [ 63 ], [ 48 ]. During the events of October 1993 in Moscow, President Kalmyks led a group of six representatives of the Conference of the Federation, was incorporated into the parliament building with a white flag [ 70 ], where, together with the president of Ingushetia Ruslan Aushev acted as an intermediary in negotiations until the evening on October 4, when Parliament was taken by storm by troops loyal to President Boris Yeltsin [ 64 ]. In November 1993, Ilyumzhinov was elected to the Council of the Federal Assembly of the Russian Federation of the first convocation of the Kalmyk district number 8. The Federation Council he entered the Committee on Agricultural Policy [ 62 ]. In April 1994, the Constitutional Assembly adopted the Kalmyk Steppe Code - new basic law instead of acting before the constitution of Kalmykia [ 61 ]. Not matching of the Constitution, in the form Steppe Code contrary to federal law and main content [53 ], [ 64 ]. According to media reports, the General Prosecutor's Office sent to the State Duma a special inquiry as to the law on the election of candidates for deputies of the Kalmyk parliament - the People's Great Hural, which noted that in Kalmykia "limited suffrage of citizens." The certificate stated that parliamentary candidates entered Kalmykia property qualification, required "election pledge" to 100 minimum wages, and a third of MPs - nine people - directly appointed by the President [ 60 ], [64 ]. In April 1995, Ilyumzhinov sent his government resigned (later returned back) after his arrival in Kalmykia Commission of Control Directorate of the Presidential Administration. Auditors, according to media reports, found many financial irregularities, in particular, they found that for the years 1993-1995 was squandered in total more than 40 billion rubles allocated from the state budget. Head Anatoly Dyatlenko Commission was to guide the detailed help, but no consequences for Ilyumzhinov it did not matter. Shortly after the audit Ilyumzhinov received a loan of 495 billion rubles allocated by the Russian government for the socio-economic support to the Republic [ 60 ]. In May 1995, Ilyumzhinov became a member of the movement "Our Home - Russia" (NDR) [ 64 ]. October 15, 1995, Ilyumzhinov was re-elected president of the Republic of Kalmykia [35 ]. In violation of federal law, he was elected for seven years, and elections were held unopposed. Officio also joined the Council of Federation of the second convocation, was a member of the Committee on Foreign Affairs. In 1998 he became deputy chairman Ilyumzhinov Committee [ 62 ]. In 1995, Ilyumzhinov abolished in the republic taxes for non-residents [ 44 ], replacing the tax revenue system of quarterly payments to the Agency for Development and Cooperation. Funds received by the Agency, the Fund disposed of controlled Ilyumzhinov President of the Republic of Kalmykia programs [ 53 ].However, the expected inflow of investments did not happen, since most companies registered in Kalmykia, according to the media, worked in other regions [ 44 ]. In November 1995, Ilyumzhinov was elected president of the International Chess Federation (Federation Internationale des Echecs, FIDE). Subsequently, repeatedly re-elected to this post (for the last time - in 2006) [ 36 ], [ 29 ]. In 1995, the media wrote about the appearance of Kalmykia organized political opposition under the slogan "Down with Kirsan!" and the creation of the opposition People's Party of Kalmykia (CDD) with branches in all areas and with cells in many state farms and with his newspaper - "Sovetskaya Kalmykia" [ 29 ]. Subsequently a number of media have pointed out that the NPCs, unable to be legitimized, soon left the political scene. Since 1998, the main ideological opponents of the regime became the regional branch of the party " Yabloko ", supported by the federal party and faction in the State Duma of the same name [ 69 ]. In 1997, the media reported that in Kalmykia thanks to the patronage of Ilyumzhinov had all the favorable conditions for the activities of totalitarian sects Sun Myung Moon, whose activities in most civilized countries is prohibited or restricted. They pointed out that the subject Moonist "My World and I" a few years until prosecutors intervened, and taught in classes and extracurricular in Kalmyk schools [ 58 ], [ 59 ]. In 2003, at a press conference on the visit President of Kalmykia Buddhist spiritual leaderthe Dalai Lama XIV , Ilyumzhinov said that the Moon sect in Kalmykia not registered and does not work - "from the end of 1993 no communists in Kalmykia have not seen" [ 43 ] . In February 1998, the head of Kalmykia issued a decree "On the optimization of government operations, increasing the responsibility of leaders at all levels", according to which the states of ministries, agencies and executive bodies within a week had to be cut "at least 50 percent." Structure as executive he reassigned directly himself. Commenting on media decree the president of Kalmykia, a spokesman for his administration said that all ministers and deputy prime ministers will remain in place, and to address questions of life of the republic will be created special committees under them, which will include former employees of ministries [ 62 ], [ 56] [ 57 ]. Already in November 1998, was appointed Prime Minister Viktor Baturin(brother-in-Moscow Mayor Yuri Luzhkov ), who held this post until January 1999 [ 38]. Up until 2003, the Government of Kalmykia changed several times [ 65 ], [ 32 ].Editor of the opposition newspaper "Sovetskaya Kalmykia Today" Larisa Yudina wrote that the next government resignation was true sign of an early arrival to the Republic High Commission [ 65 ]. In June 1998, Yudin - author of numerous revelatory material about Ilyumzhinov - was killed. Her murder was accused Ilyumzhinov Advisor for Legal Affairs Sergey Vas'kin previously repeatedly convicted. Ilyumzhinov during the investigation repeatedly said if the murdered journalist engaged in commercial activities, and the version of the assassination rejected [ 64 ]. Immediately after the murder of the journalist leaders of "Yabloko" stated that this politically motivated crimes, as Yudina "actively fought against corruption in the leadership of Kalmykia" [ 54 ]. June 14, 1998 in an interview with news program "Observer" (TV-6) Ilyumzhinov announced his intention to run for president of Russia [ 50 ], [ 64 ]. In September 1998, was completed Ilyumzhinov initiated construction New Vasiukov or Chess City (City Chess) - a hotel complex on the southeastern outskirts of Elista [ 42]. According to some media, construction was cost money: Ilyumzhinov demanded Hural approve the transfer of 236 million rubles from the Russian Ministry of Finance account to the account of the Ministry of Finance of the Republic. In order to continue to avoid such situations, the Central Bank of Russia issued the order to cease financial transactions with the bank Kalmykia (later the order was suspended action) [ 52 ]. November 17, 1998 Ilyumzhinov declared readiness of the republic to secede from the Russian Federation. According to the party "Yabloko", threatened Ilyumzhinov, Kalmykia come from Russia, if the republic will not be revoked by the inspection team of the Chamber of Accounts [ 49 ]. According to others, as the cause of his speech called Ilyumzhinov of Kalmykia blockade by the Russian Ministry of Finance [ 52 ]. On the same day, Russian President Yeltsin instructed to consider applications Ilyumzhinov Russia's Security Council, and the next day Ilyumzhinov said that the statement made ​​in a personal capacity [ 64 ]. Finance Minister Mikhail Zadornov hearings in the State Duma said Ilyumzhinov actually spent in the August issue in excess of 200 million rubles, which is not transferred to the accounts of the National Bank of the Republic (the analogue of the Main Directorate of the Central Bank), and in the clearing bank "Kalmykia" [ 64 ] , [ 51 ]. In March 2000, Ilyumzhinov became chairman of the board of directors of multinational corporations "Nostrak" [ 36 ]. October 27, 2002, Ilyumzhinov was elected President of the Republic of Kalmykia for a third term [ 35 ], [ 62 ], in January 2003, took over the government of the Republic of Kalmykia [ 62 ]. In November 2004, when the State Duma passed a law allowing high-ranking officials to combine work with party activities, Ilyumzhinov joined the party " United Russia "[37 ]. In the summer of 2005 by the decision of the People's Khural of the Principal Officer in the country was renamed and became known as the "head of the republic of Kalmykia" [ 33 ]. In October 2005, addressed to the president Ilyumzhinov Russian statement, which raised the question of trust and early resignation to under federal law "On Amending the Federal Law" On general principles of organization of legislative (representative) and executive bodies of state power of subjects of the Russian Federation "and the Federal Law" On Basic Guarantees of Electoral Rights and the Right to Participate in Referendum in the Russian Federation "," December 11, 2004.October 24, 2005 at the suggestion of Vladimir Putin's People's Khural of Kalmykia for another five years Ilyumzhinov gave powers of the Head of the Republic of Kalmykia [62 ], [ 35 ]. According to some media reports, during the work of the head Ilyumzhinov of Kalmykia republic halved oil significantly decreased the production of meat and grain.Ceased to exist almost the entire industry. 75 percent of the population lives below the poverty line [ 63 ]. July 5, 2006, Ilyumzhinov was involved in a scandal involving a "matter Chakhmakhchyan Levon "- a member of the Federation Council, suspected of receiving a large bribe. On this day, the Speaker Council Sergei Mironov sent understanding of early termination of the powers of the senatorial Chakhmakhchyan [ 26 ], [ 27 ].Ilyumzhinov said that the People's Hural shall meet idea of early termination of powers Chakhmakhchyan [ 25 ]. 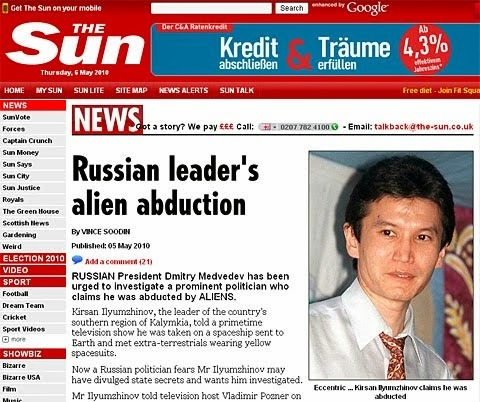 In this "Kommersant" newspaper claimed that between Ilyumzhinov and senator has a long friendships: Chakhmakhchian supported Ilyumzhinov's presidential election in 2002, and Ilyumzhinov, in turn, lobbied Chakhmakhchyan election to the Federation Council [ 28 ]. In October 2007, Ilyumzhinov has headed the regional list of candidates "United Russia" in the Republic of Kalmykia in the elections to the State Duma of the fifth convocation [ 24 ]. After the victory of the party parliamentary mandate, as expected, declined [ 23 ]. In December 2007, in Kalmykia, Ilyumzhinov announced a campaign to "rejuvenate the cadres' and 5 December dismissed the government of the republic, and December 12 appointed his new composition. December 20, 2007 members of the People's Khural of Kalmykia majority vote also decided to disband. According to the press secretary of the head of the republic Buyanchi Galzanova, "it was made voluntarily, on the recommendation of Kirsan Ilyumzhinov." According to former deputy Hural, a member of the faction "United Russia" Leo Muhlaeva idea dissolution owned by parliamentarians, and they offered it as an option Ilyumzhinov "parliamentary crisis resolution." Among the causes of the latter deputies called "protracted confrontation within the parliamentary faction" United Russia "[ 22 ]. Ilyumzhinov also offered to resign Mayor Elista Burulov radium (which, as noted by "Nezavisimaya Gazeta", was a year younger than the head of the republic). However, the part with his armchair would not. Thereafter, at a meeting with the Vice-Mayor of Elista, held January 4, Ilyumzhinov, according to the participants, said that now guide the city he takes on, and implementation of the budget Elista instructs the government of the republic. "NG" emphasized that it is, in fact, meant the introduction of direct Elista Republican rule. January 9 Burulov gathered an emergency meeting of City Council, where he made a tough accusations against Ilyumzhinov and, in turn, invited the head of the republic voluntarily resign and retire. Noted that the performance of the mayor caused a huge public outcry in the country: the circulation "Elistinskaya panorama" with text mayor's speech, was sold out in less than an hour, and a photocopy of his statement can be purchased in public places for 100 rubles per copy. According to "Nezavisimaya Gazeta" in the conflict had to intervene by representatives of the federal government, proposed to postpone the dispute resignations before the election and inauguration of the new president of Russia, whose elections were scheduled for March 2008 [ 21 ]. In March 2008, it became known that the Investigation Department of the Investigative Committee of the Prosecutor against the mayor on Kalmykia Elista was prosecuted on suspicion of abuse of power [ 20 ]. In the same month, after a petition investigating authorities Elista City Court dismissed Burulov from office [ 19 ]. November 12, 2008 Ilyumzhinov got in an accident on the highway Rublevskom and was hospitalized in the CDB with a concussion and bruises on his head. However, a few hours later he was discharged because of serious injuries, according to the survey, not received. Culprit accident traffic inspectors recognized the driver control the car head of Kalmykia, [ 18 ], [ 17 ]. 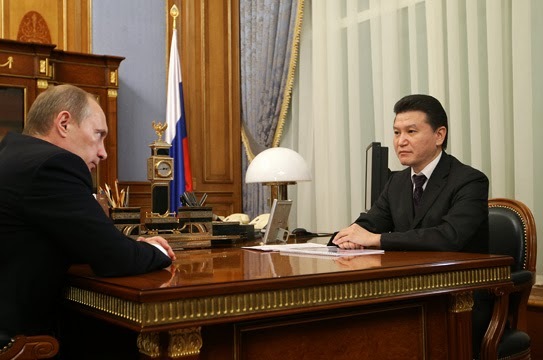 In late May 2009, Ilyumzhinov his decree to terminate the powers of the government with the aim of Kalmykia "optimize resources spent on executive authorities." It was noted that for the 16-year reign was the ninth Ilyumzhinov is a change of government.Another decree of the head of the republic has reorganized its administration - it crossed the functions of the republican cabinet. Commenting on the next reshuffle in Kalmykia, local observers have connected them with the desire to avoid Ilyumzhinov responsibility "for serious shortcomings in his work" [ 16 ]. April 21, 2010 Chairman of the Supervisory Board of the Russian Chess Federation Arkady Dvorkovich said that Ilyumzhinov was re-nominated by the Russian FIDE President, whose elections were to be held in the autumn [ 15 ]. However, the main supporter of Ilyumzhinov's alleged election Anatoly Karpov announced illegitimacy of this extension [ 14 ], and also accused the FIDE leadership of corruption, then in June 2010, Ilyumzhinov gave him to court for defamation [ 13 ]. In July 2010, he appealed to the Karpov International Sports Arbitration (CAS) in Lausanne and demanded to recognize that the nomination Ilyumzhinov passed impairment [ 12 ], but on the eve of elections of the FIDE, September 27, it became known to reject this claim [ 8 ], [ 9 ].September 29, 2010 the General Assembly of the FIDE Congress in Khanty-Mansiysk the FIDE President Ilyumzhinov re-elected: voted for him 95 delegates, and for his rival Karpov - 55 members of Congress [ 7 ]. 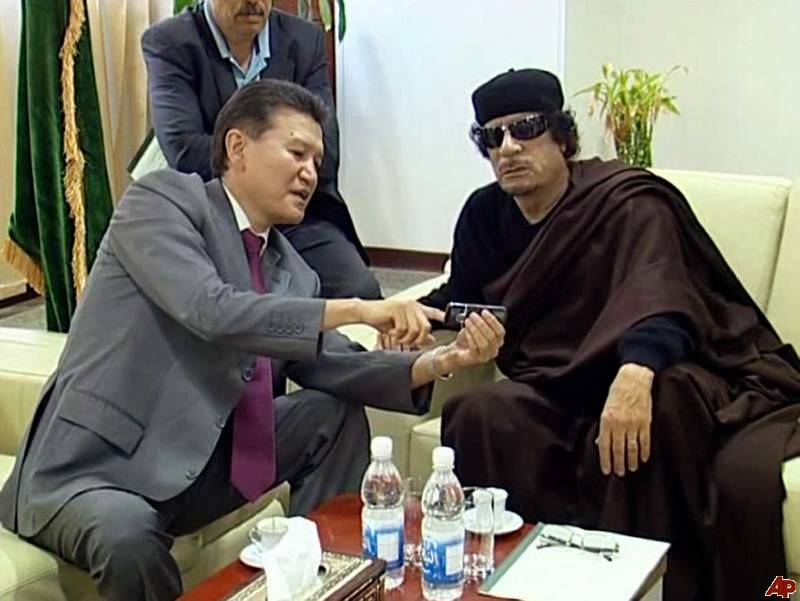 September 6, 2010, Ilyumzhinov said he did not intend to stay on as head of Kalmykia after his fourth term [ 11 ], [ 10 ]. 24 October of the same year as the head Ilyumzhinov of Kalmykia Alexei Orlov officially changed. On the same day the new head Ilyumzhinov approached with a proposal to head the government of the republic, but he refused to officially [ 6 ]. Regarding his plans after leaving the head of Kalmykia, Ilyumzhinov said that "as a citizen of Kalmykia" will "seek to Kalmykia invitation of His Holiness the Fourteenth Dalai Lama and turning the center of Elista chess world" [10 ]. In summer 2011, Ilyumzhinov appeared in the press as a co-owner of the experimental art-production association (EHPO) "Vel" (as of March 2011 the former head of Kalmykia owned 18.5 percent of the company). By this time, "Vel", previously worked on the restoration of the Kremlin Palace halls, buildings of the Bank of Russia, the Russian State Library, Moscow GUM shopping center, the hotel "Savoy" and Moscow subway stations, start the procedure of bankruptcy and was most troubled borrowers Rosbank [ 4 ]. In June 2012 it became known that the company owned Ilyumzhinov Credit Mediterranee acquired 52.5 percent stake in Petrol Holding, a monopoly in the oil market in Bulgaria. Ilyumzhinov himself said that in the near future intends to buy the remaining share holding. In addition to filling stations and oil storage assets of Petrol Holding mentioned hotels, casinos, the airline and the football club. Noted that the company has high debt, moreover, the buyer has committed itself to modernize its affiliated gas stations. Amount of the transaction was not called, but analysts estimate that it has exceeded $ 1 billion [ 2 ]. In July 2012, the Ilyumzhinov acquired a stake Group "Syukden" - Russian sugar producer, is part of the largest international sugar trader Groupe Sucres & Denrees.Amount of the transaction and the number of shares bought in the press were not called, but stressed that Ilyumzhinov has become a key shareholder of the group of companies [ 1 ]. Ilyumzhinov - member of the Academy of Social Sciences (1997), Honorary Academician of the Interregional Academy of science of science (1997), Honorary Doctor of the National Academy of Applied Sciences of Russia (1998). Member of the Union of Cossacks of Kalmykia (1990) [ 36 ]. In April 1997, presidential decree Ilyumzhinov was awarded the Order of Friendship "for services to the state and a major contribution to strengthening friendship and cooperation between peoples. "Ilyumzhinov also has a number of award winning non-governmental organizations, including the Gold Medal of Peace for the humanitarian activities of FIDE (1992) and the Order of Prince Daniel of Moscow, first degree - the highest award of the Russian Orthodox Church [ 36 ]. In April 2012, he was awarded the title Hero of Kalmykia [ 3 ]. Ilyumzhinov - master of sport of chess. Also Kalmyk and Russian languages, speak Japanese, English, a little Korean, Mongolian and Chinese. Calls himself a Buddhist [62 ]. Ilyumzhinov is married (his wife went to the same school). In 1990 he had a son, David [ 55 ], [ 62 ]. Also Kirsan, the family had two sons [ 64 ]. Kirsan elder brother Vyacheslav also graduated from MGIMO [ 55 ], [ 66 ]. In the years 1985-1993 was a member of the Foreign Ministry of Kalmykia [ 66 ], after the election of President Kirsan served as state adviser on ideology and Deputy Prime Minister of the Republic of Kalmykia [ 67 ].In the early 2000s he was deputy governor of the Nenets Autonomous Okrug Vladimir Butov [ 46 ], [ 45 ]. As of early 2006, Vyacheslav Ilyumzhinov - Chairman of the Board of Directors of CAP [ 30 ], [ 55 ], a member of the International Union of Economists - General Counsel of Economic and Social Council (1995) [ 55 ], [ 68 ]. In November 2010, Vyacheslav Ilyumzhinov was appointed first deputy prime minister of Kalmykia, Orlov. 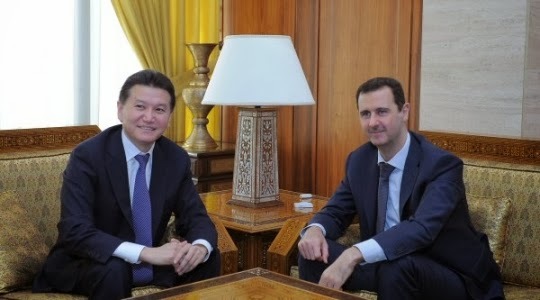 Experts called it "viceroy" Kirsan Ilyumzhinov and suggested that so he will retain its influence in the region [ 5 ]. Kirsan Ilyumzhinov, the younger brother Sanal - economist. He graduated from the Moscow Finance Academy [ 55 ]. By the end of 2005, directs the National Clearing Kirsan private bank, which is the main shareholder of JSC NC "Kalmpetrol" [ 31 ], [ 39 ].According to some media reports, in a commercial structure, led by Sanal Ilyumzhinov, except banks are supermarkets, the company that sells household appliances and computers, a number of salons and mobile communication network of wholesale bases. This structure is a sponsor of "News of Kalmykia" - the main official newspaper of the Republic [ 34 ].